Sixteen-year-old Hamza Mustafa and his father Khaled, who had arrived in New Zealand only a few months ago after escaping Syria, were laid to rest yesterday, the first victims of the Christchurch mosque attacks to be buried. Hamza's 13-year-old brother, Zaid, watched from a wheelchair, his leg bandaged from where he had been shot, as the bodies were lowered into the ground. They were shot at the Al Noor Mosque on Friday, victims of a gunman who posted anti-immigrant rhetoric online before he launched the attacks on two mosques and killed 50 people. Police now say he had planned a third attack. Hamza called his mother Salwa after the attacks began. He was running with his brother when she heard more shooting and screaming, and then nothing. After the attack was over, someone picked up the phone and told Salwa her son was dead. Hamza was a talented horse rider and loved to play football and go fishing, his classmates at Cashmere High School said. 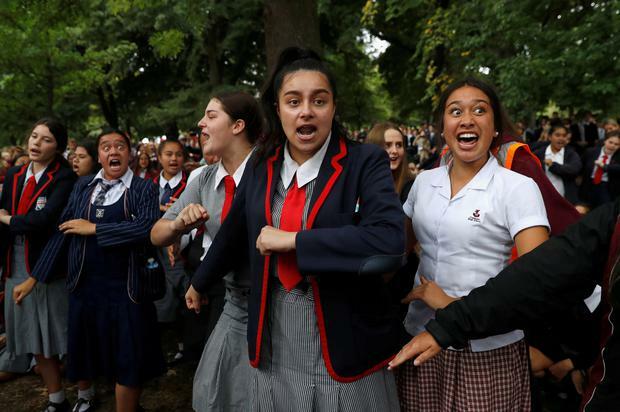 Prime Minister Jacinda Ardern visited the school, which also lost another student and a former student in the shootings. "There will be some interest in the terrorist who did this. But if I can make one request: Don't say his name," she said. "Don't dwell on who he is. Dwell on your friends." Police Commissioner Mike Bush said the alleged gunman, who is in custody, was on his way to attack another target when he was apprehended. "We believe we stopped him on the way to a further attack, so lives were saved," he said.